Replacement bee guards for Perky-Pet® 203C and 203CP. 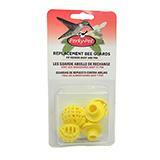 A great economical and convenient way to keep bees from bothering the birds as they feed at your hummingbird feeders. Four yellow bee guards per pack.